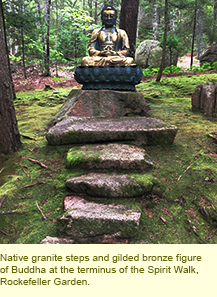 Discover garden paradises, granite boulders, and moss-carpeted forests. Mount Desert is the largest of the rocky islands that protrude from the waters along the coast of the Gulf of Maine. Dramatically incised with deep harbors and thickly forested with spruce and birch, it became a scenic haven for mid-nineteenth century Hudson River School painters who thought of themselves as “rusticators.” Following in their footsteps, prominent members of the wealthy elites of New York, Boston, Chicago, and Philadelphia decided to forego the whirlwind social life of Newport and acquire tracts of land on remote Mount Desert Island. They built comfortable shingle-style houses with foundations, chimneys, and ornament of rough-hewn, local granite. Among these summertime dwellers were the members of the Cadwalder Rawle-Rhinelander Jones family, whose waterfront property in Bar Harbor, Reef Point, is the former home of Beatrix (Jones) Farrand (1872–1959). Considered by many landscape historians as the most talented creator of both private and institutional gardens at the turn of the twentieth century, Farrand found a mentor in botanist Charles Sprague Sargent, founding director of Boston’s Arnold Arboretum, during a year-long residence in his Brookline home in 1893. She rounded out her skills at the Columbia School of Mines, mastering drafting to scale, elevation rendering, surveying, and engineering. Furthermore, she educated her eye on trips to Europe with her aunt Edith Wharton, author of Italian Villas and Their Gardens. In addition to absorbing the axial layouts and ornamental details of Renaissance classicism, she gained inspiration of a different kind by visiting the English gardens of Gertrude Jekyll and William Robinson, seminal writers on naturalistic designed landscapes that combined horticultural specimen plants with native species. Underlying Farrand’s self-crafted program of career preparation was the activity of gardening at Reef Point as a child. Her love for the property continued to grow after she assumed its ownership as an adult and made it her laboratory for garden design and horticultural experimentation. Her hands-on approach to gardening honed her talent and assisted her in attracting a clientele made up of Bar Harbor neighbors and other estate owners in New York, Connecticut, and elsewhere. Today six-acre Reef Point is divided into separate house lots. Farrand’s home and colorful summer garden beds have been demolished, leaving it to one’s imagination to reconstruct what was once there with the help of old photographs, garden notes, plant lists, and Reef Point Bulletins – Farrand’s series of publications from 1946 to 1956. But there is another means of understanding her genius. With great fortitude, three years before her death, she oversaw the dismantling of her Reef Point garden so that her collection of exceptional plant species could be preserved elsewhere on Mount Desert Island. Happily, however, one can now see some of her original specimen trees and shrubs as well as similar ones that replaced them over time at the Asticou Azalea Garden and the Thuya Garden in in Northeast Harbor, both of which were designed by John K. Savage, a protégé of Farrand’s. 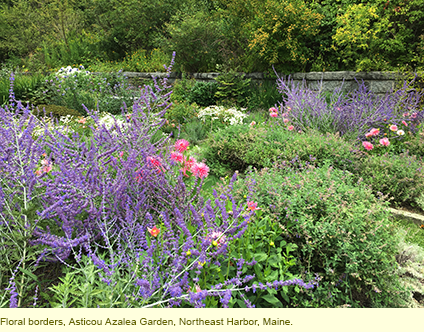 Other transplants from Reef Point can be found at Garland Farm, the Bar Harbor ancestral home of Lewis Garland, her Reef Point property manager, and his wife, Amy, who was Farrand’s horticulturist and close friend. Here local architect Robert Patterson, who continued to manage and oversee the disassembly of the Reef Point Gardens, designed a comfortable single-floor addition to the Garland farmhouse with generously proportioned rooms incorporating architectural details bearing the stamp of Farrand’s style. It was here that, with the assistance of the Garlands and the companionship of her friend Clementine Walter, Farrand spent the final years of her life. Fortunately, in In 2004 Garland Farm became the property of the Beatrix Farrand Society, and with the help of an active board, devoted volunteers, and a small staff, both house and garden are being restored and maintained. Serving as a landscape-design study center, it now has planting beds containing the kinds of floral combinations Farrand liked and some fine and unusual specimen plants, many of Asian origin. 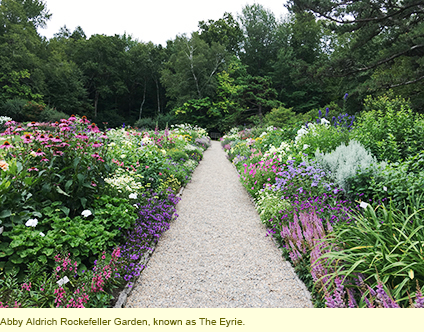 These gardens, along with the Abby Aldrich Rockefeller Garden, formerly known as the Eyrie – which Farrand designed at Seal Harbor for Abby Aldrich Rockefeller and John D. Rockefeller Jr. over a ten-year period and as a continuing consultant for the next twenty – demonstrate how she incorporated Asian influences into her work. With the collaboration of these sympathetic clients, she created an unusual garden with Japanese, Chinese, and Korean artifacts and stylistic details in conjunction with her signature garden beds designed in the manner of Gertrude Jekyll. The Eyrie has a Spirit Path flanked by Korean processional figures and a sunken flower garden enclosed by a pale pink, stucco-coated brick wall capped with yellow-glazed coping tiles and punctuated by a Chinese moon gate and a bottle gate. It is one of her finest extant masterpieces. Local landscape designers have been inspired by Farrand’s ability to combine a Japanese aesthetic with the harmonious, color-sensitive floral combinations that were a hallmark of her horticultural style. For example, Charles Kenneth Savage, with the financial help of John D. Rockefeller Jr., incorporated azaleas, rhododendrons and other imported specimen plants from Reef Point in his design for the property opposite the Asticou Inn in Northeast Harbor. 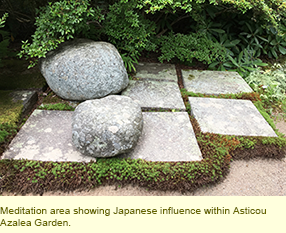 With carefully raked gravel paths, a Roanji-inspired Japanese garden, secluded plant-enclosed nooks for meditation, and impeccable maintenance, the Asticou Azalea Garden merges Eastern and Western garden traditions. The nearby Asticou Terraces and Thuya Lodge, which are also the beneficiaries of transplants from Reef Point – including a magnificent dawn redwood (Metasequoia glyptostroboides)—are well worth the steep climb up a trail. Splendid views of the rocky Northeast Harbor coastline are an added bonus. Gazing down at the warm pinkish-grey tones of the glacially scoured, sea-tumbled, soft-edged rocks that form this part of the Maine coastline one sees why Farrand and other Mount Desert garden makers, like Japanese ones, integrated boulders into their landscape designs and used native granite for steps and other building forms. Finally, a trip to Mount Desert would not be complete without a visit to Acadia National Park, where Farrand worked closely with John D. Rockefeller Jr. on the alignment and grading of a series of carriage roads, and with nurserymen William and Charles Miller on the selection and installation of naturalistic hybridized plants to mingle harmoniously with such native trees as pitch pines and a forest floor covered with ferns, and mosses. One can only experience the recently restored carriage drives by bicycle, on foot, or in a horse-drawn carriage, but automobiles can be driven along the main road, which leads up to the summit of Cadillac Mountain. The spectacular views of glacial ponds and forested slopes en route provide a comprehensive and unforgettable impression of the geography of Mount Desert. Reflecting on the entire Mount Desert experience, the take-away impression is one of enlightened land preservation and a unique blend of nature and art in the work of Farrand and the garden designers who came after her. Brouse, Roxanne. The Public-Spirited Beatrix Farrand of Mount Desert Island. The Beatrix Farrand Society Press, 2016. Brown, Jane. Beatrix: The Gardening Life of Beatrix Jones Farrand, 1872–1959. New York: Viking, 1995. Farrand, Beatrix. The Bulletins of Reef Point Gardens. Introduction by Paula Deitz. Bar Harbor, ME: The Island Foundation, 1997. Farrand, Beatrix. The Collected Writings of Beatrix Farrand: American Landscape Gardener, 1872–1959. Edited by Carmen Pearson. Lebanon, NH: University Press of New England, 2009. Tankard, Judith. Beatrix Ferrand: Private Gardens, Public Landscapes. New York: The Monacelli Press, 2009.